Mouthguards are essential for protection during certain sports and physical activities. Without them, you’re likely to experience tooth injuries like cracks or fractured roots. Some individuals even experience the complete loss of teeth! This is why athletes need to take extra precautionary measures to protect their teeth and prevent dental problems in sports. If you’re unsure how to select the best mouthguard for you, we’ve provided some guidelines. It is in your best interest to use these tips as you shop for a new mouthguard. Will you need to speak extensively while wearing your mouthguard? In some sports, communication is critical. For example, football players may need to shout instructions to their teammates, and boxers may need to speak with their coaches in between rounds. If your activity requires you to speak, you’ll need to select a mouthguard that doesn’t hinder your speech. The need to remove your mouthguard every time you talk is inconvenient, annoying, and in many sports, impractical. If communication is a priority for you, you should select a slim, tight-fitting mouthguard that allows you to speak clearly while you’re wearing it. If you are wearing braces, finding the right sports mouthguard can be a little more difficult. Some brands offer mouthguards that are specifically designed for this purpose. They fit snugly over the metal brackets. In addition to protecting the teeth from damage, this also enables the mouthguard to protect the inside of the mouth from any lacerations that the brackets or wires could cause on impact. One of the main challenges of shopping for mouthguards when you have braces is that your teeth are constantly moving. As a result, you may need to purchase new mouthguards at regular intervals to make sure they fit correctly as your teeth change positions. In some cases, you can now buy mouthguards that are made from a flexible silicone material, which adapts to a changing mouth structure over time. This saves you time, money, and the hassle of constantly changing mouthguards! If you’re playing a contact sport with a high risk of injury, comprehensive protection is likely to be at the top of your priority list. Football players often use larger mouthguards, which protect the lips as well as the teeth. These are molded into a shape that resembles a pacifier and feature holes to allow sufficient air flow during use. These types of mouthguards often come with straps that can be connected to a helmet. If football mouthguards aren’t what you’re searching for, other options provide great protection. When you’re shopping online or in a sports store, it is important to examine the shape and design of each product. Some mouthguards provide extra layers with different materials layered on top of each other. This can be a good option for receiving sufficient protection at a relatively low price. A mouthguard that doesn’t fit correctly is not only uncomfortable but it can also hinder your ability to compete at your highest level. If the mouthguard is big, bulky, and poorly fitted, you won’t be able to breathe, drink or speak properly. To avoid this problem, it is wise to utilize a boil and bite mouthguard that has a gel layer. They provide a more accurate fit than the standard single plastic mouthguards. If you’re wondering how to mold a mouthguard to your teeth at home, don’t worry. It’s actually quite easy! You simply need to boil some water, let the mouthguard soak in the hot water for a few minutes to heat up, then place it on your teeth. It is important to hold the mouthguard in place until it cools down so you have a good fit. If you’re searching for an even better fit, you can have a custom mouthguard created at your dentist’s office. A dentist can take a mold of your teeth, send it off to a lab, and then create the perfect mouthguard fitted precisely for your mouth. This is the most expensive option, but it’s also the best and most effective type of mouthguard for athletes. When you receive a mouthguard from a dentist, you can also select the thickness of the plastic utilized to make it. This allows you to select the exact level of protection you desire. Another bonus of acquiring a custom-made mouthguard is that you can choose your colors or designs. If you prefer to have graphics or text across the front of your mouthguard, your dentist can arrange that for you. 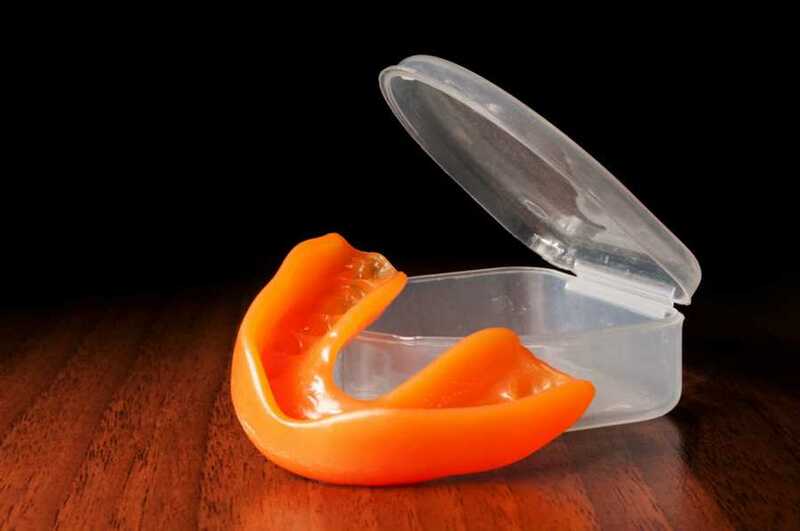 It is worth noting that some individuals are able to create custom mouthguards without visiting the dentist. A few manufacturers provide at-home molding kits, which allow you to take the mold of your teeth and send it off to the lab yourself. Do you find the taste of rubber, plastic or silicone repulsive? Many people can’t stand the taste associated with mouthguards. If you’re one of them, there is a solution for you. Some companies now offer flavored varieties of mouthguards. These mouthguards have a flavoring embedded into the plastic to create a fruity, minty, or even a bubble gum taste instead of a plastic one. If you desire a quick and easy solution for oral protection during sports, you can buy a mouthguard that fits instantly. Some mouthguards have an instant fit technology, which allows them to be worn straight out of the packet. They contain a gel which fits the shape of your mouth, without requiring any boiling or preparation. This type of mouthguard allows you to simply grab and insert it! If cost is a significant factor, it can be tempting to purchase the cheapest mouthguard you can locate. However, this strategy could end up costing you more in the long run, especially if you don’t have dental insurance. It is important to remember that you can’t put a price on your health. If you buy a cheap mouthguard, you risk incurring significant other dental fees later down the line. If you’re not sure what is the best mouthguard for you or your child, it is wise to schedule a consultation with your dentist. They’ll be able to guide you through all the available options and provide you with some good advice for your specific situation. At Laser & Cosmetic Dental Denter of Boca Raton, we’re happy to discuss all of your oral healthcare needs. Contact us with any questions or to schedule an appointment!